Summer is right around the corner, and I need to get my house clean. We have friends and family who always stop through when they come to town, so I want to make sure my house is in top form. I like a clean home, plus it lowers my stress level. Summertime is very busy, and I don’t want to be cleaning every day. 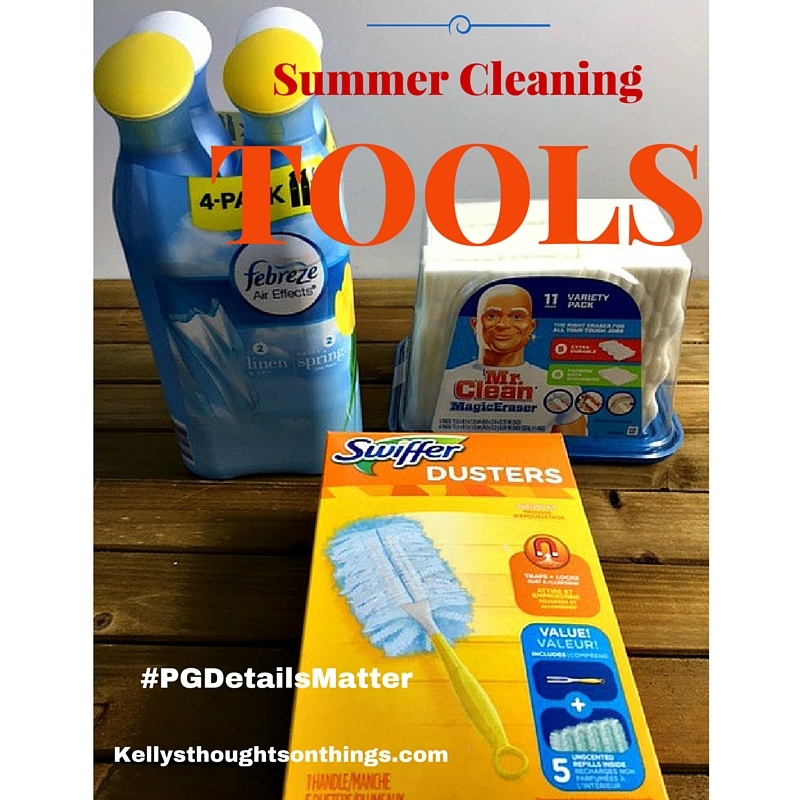 In June, I print out my Summer Inside Cleaning Checklist and place it on the fridge. You can PRINT this checklist too! Then I head to Costco because they have all the Procter & Gamble cleaning products I need to get this job done. I do assign chores to my family even though I hear all kinds of excuses but I just give that MOM LOOK, and they stop. I’m a big believer in TEAMWORK! We all live in this house so we all will clean. My family doesn’t agree with my reasoning, but I’m queen bee in my home, so what I say goes. I put the kids in charge of the LIVING ROOM; I got them Mr. Clean Magic Eraser and Swiffer Dusters to help them do the best job! Mr. Clean Magic Eraser quickly wipes out dirt and grime with its water­activated MICRO SCRUBBERS. It is safe on lots of surfaces but make sure to check out the back of the package. One kid will erase all the marks on the walls and of course clean the baseboards. Look how clean Mr. Clean got my baseboards (picture below). My baseboards get filthy with the pets and kids running in and out of the house. The other kid will DUST away with Swiffer Dusters. Such an easy job too! I use this daily because dust loves our house. What I like about the Swiffer Dusters is they trap and lock dust from any surface. I can keep every nook and cranny dust and allergen free because the Swiffer Dusters’ fluffy fibers that trap and lock 3X (Common inanimate allergens from cat and dog dander and dust mite matter) MORE dirt, hair, and allergens than feather dusters. I’ll never go back to rag or feather dusters, all they do is move dust around. Cleaning all the bedding and rugs is imperative because they tend to pick up funky odors from the house and pets. I like to use Downy Fresh Protect because it 0ffers all­day odor control. The MOTION­ACTIVATED ODOR SHIELD works all day long – like deodorant for your clothes! I add Downy Fresh Protect Beads in the drum of the washing machine before the clothes. They will dissolve in any temperature cycle. My clothes smell so darn good. With all the backyard parties we have, I also need to get Cascade Complete Action Pacs because my kids who do the dishes are quite lazy. They don’t like to hand rinse dishes before putting them in the dishwasher. With the power of Dawn, Cascade Complete Action Pacs ensure I’m covered and dishes don’t need to be prewashed. My dishes come out clean and shiny! Now for the DAILY chore, I do every day, so I need a lot of this, Kids, animals even husband funk up this house all day long. My nose is, always scrunched up wondering what that smell is but now I just SPRAY Febreze Air Effects because it doesn’t just mask the smell but indeed eliminates the odor. Febreze Air Effects contains a crew of patented molecules that straight up ELIMINATE STINK. I buy the value 4­pack, so can keep them in the kitchen, bathrooms, bedrooms, and living room. I want to smell that fresh smell everywhere! 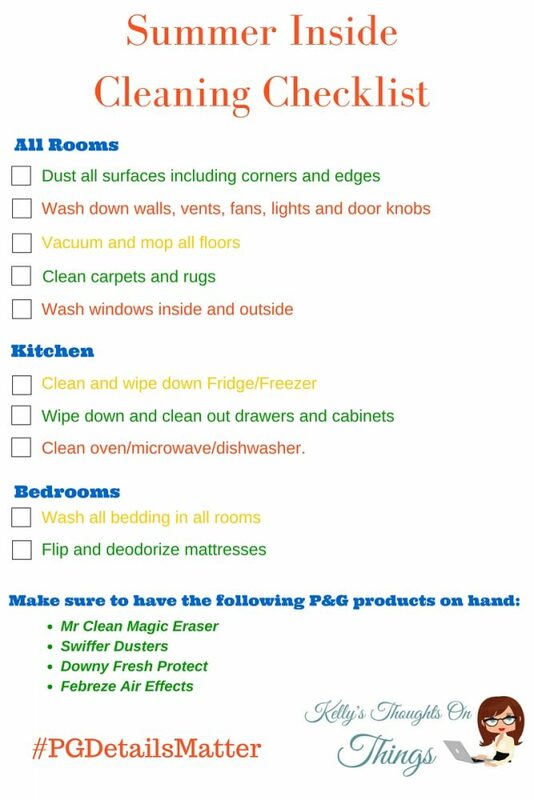 Make sure you PRINT OUT SUMMER CLEANING CHECKLIST. Leave us a comment and let us know ONE CLEANING PRODUCT YOU CAN’T DO WITHOUT!